The audio capability of the original IBM PC was that of a tiny speaker. It was great for making beeping and tweeting sounds, but not much more than that. 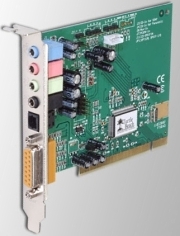 If you wanted more sound capability you needed to install a sound card (also called an audio adapter card) into one of the motherboard's expansion slots. Today's PCs have the audio circuitry built-into the motherboard (also called on-board audio). However, some users require greater audio capability than the on-board audio circuitry can provide, for example if they want to create or listen to music or enjoy the sound effects of realistic computer games, they may want to disable the on-board sound circuitry and install a sound card with digital audio output and surround sound. Regardless of whether the sound circuitry is built-into the motherboard or located on an audio adapter card, it will provide the same external connectors. Minimally it will provide three mini-jack connectors; a green connector called Line Out for the connection of stereo speakers, a blue connector called Line In for the connection of audio input devices, and a pink connector for a microphone input. Actual physical sound is an analog phenomenon that occurs as waves. Waves have the properties of amplitude and frequency. The computer is, of course digital, so a sound stored on a computer disk is digital data. To output the sound to a speaker, the PC sound circuit uses a digital-to-analog converter (DAC). Sound input to the computer for recording, for example by a microphone, must be digitized. For this the PC sound circuit uses an analog-to-digital converter (ADC). So PC sound circuitry is primarily an AD/DA-converter or a coder/decoder, which is usually shortened to codec. In order for an analog sound to be converted to digital data, it must be sampled. The quality of a PC sound circuit is determined by the frequency at which it samples the sound, and the number of bits that it uses to resolve and store the sample. Through the years, PC sound circuits have evolved, starting from 8-bits at 11.025 kHz, to 32-bits, at 192 kHz. In 1997 Intel released the Audio Codec 1997 specification (AC97). AC97 specified the signal interface that a codec chip integrated into the motherboard should use to interface to Intel's CPUs. It also specified a 48KHz sampling rate. Later versions of AC97 specified features like variable sampling rate, multichannel output, SPDIF (Sony/Philips Digital Interface for audio), and support for Plug-and-Play. In 1982 the Musical Instrument Digital Interface (MIDI) protocol was defined, which allowed electronic musical instruments to interface to the PC. An important characteristic of a MIDI capable sound card is polyphony, which is the number of "voices" it can play simultaneously. A voice is a group of frequencies that simulate a particular musical instrument. It would require a large number of DACs to achieve high polyphony, so modern sound cards use advanced DSP (Digital Signal Processing) chips instead.